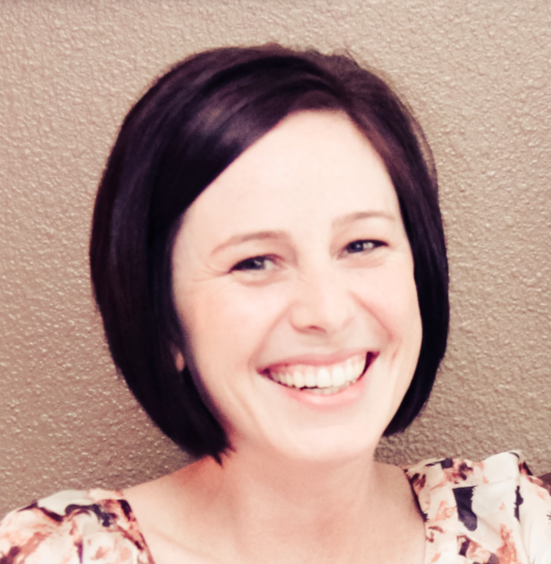 I am an Instructional Technology Specialist for Brenham ISD. My favorite hobby is tweeting and building my PLN. I love finding new Web 2.0 tools to share with my faculty and students and I think social networking can be a powerful educational tool. I am a Google junkie...a perfectionist in everything I do (sometimes to a fault! )...and I am one of those people who genuinely enjoys getting up and coming to work each day! Some things you should know before you take the test! Only stored files (.doc, .jpg, .pdf) count toward your storage limit (5GB). Google Docs format don't use storage space. This feature is only available with Chrome and must be set up. This is view-only ... you must go back online to make edits or create new doc. Must be enabled on each individual computer you use. You can share with up to 200 editors/viewers or make it public for all to see. 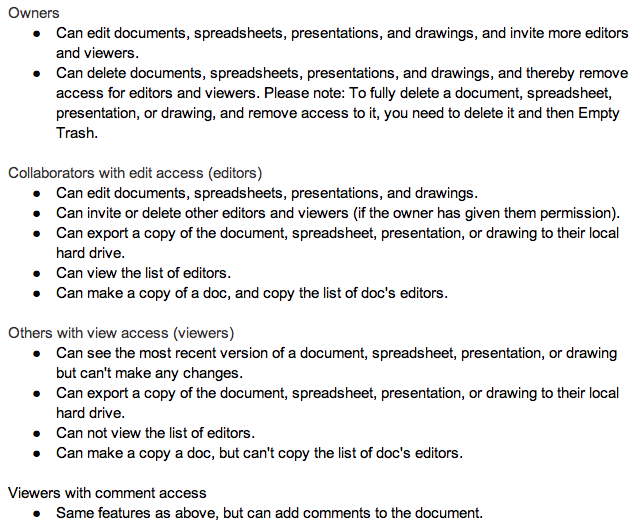 50 can edit / view a spreadsheet, document, or drawing simultaneously. 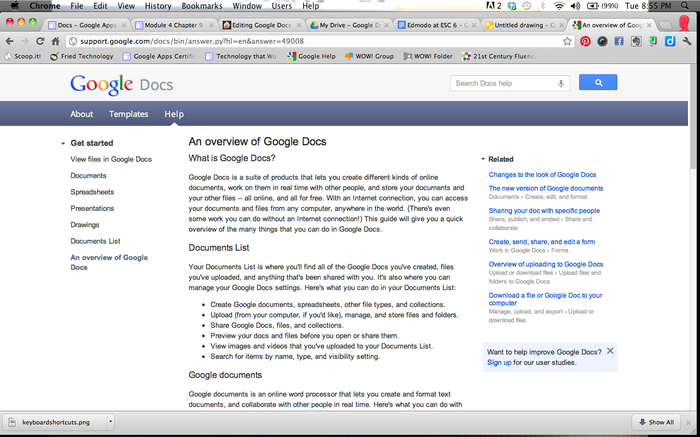 10 can edit / view a presentation or a document in the older version of Google documents. Or you can share documents or folders with groups - a single email address that includes multiple members. Your domain administrator must enable the setting to allow you to share docs outside of your organization. You can also individually invite collaborators by email ... doc will not show up in their drive (shared with me) until they open it from the email attachment. There are 3 ways to remove a collaborator: one at a time, by changing visibility options for the doc, or make the document private. You can publish your document as a simple webpage where anyone with the link can view the contents - good for sharing with large audience (more than 50). The access rights you have set are retained. You can also embed the document using HTML code after you have published it. Printing documents allows you to save a PDF or print a hard copy of your document. To start a new document, go to your Drive, click on create and choose what type of document you want to create. Or you can click on the upload box (next to create) and upload a file or folder. You can also drag and drop the file from your computer into your documents list or into your Drive, if you've installed it on your computer. It's easy to find documents using the search bar - start typing and it will make recommendations. You can change cell data type within a cell and also insert functions. There are two ways to add links in a cell: enter the full URL into the desired cell or use the hyperlink formula. 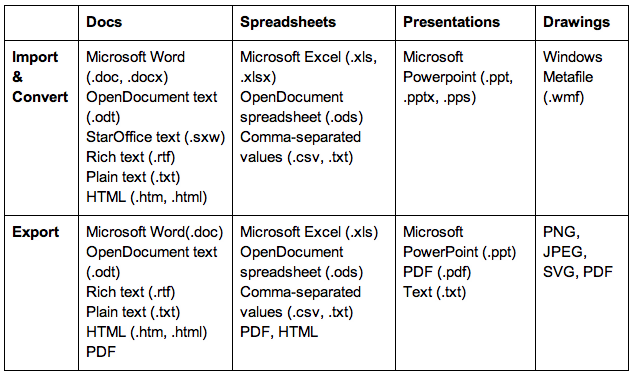 You can also insert images, charts and gadgets into spreadsheets. Hit Ctrl+/ (or Cmd+/ on a Mac) to pull up the list of shortcuts. Same sharing and visibility rules apply with spreadsheets as well as collaboration features. You can insert comments in cells, chat with other collaborators, protect sheets and set up notification rules for spreadsheet modifications. You can add, remove, copy, and hide sheets within your spreadsheet. You can create dropdown lists in individual cells through the data validation tool by validating against a range of cells in your sheet or by creating a custom list. Again, the same sharing and visibility rules apply, as well as collaboration features and revision history. You can either upload and convert an existing presentation, create a new presentation or choose a template from the gallery. You can insert images (upload, snapshot, or URL) and even embed videos into your presentation. Easily add (4 different ways), delete, move and modify slides or customize the look with backgrounds, layouts, and themes. Add transitions between slides and animations to individual elements on your slides. You can also embed your entire presentation using HTML code by publishing it to the web. Create forms with 7 types of questions: text, paragraph text, multiple choice, checkboxes, choose from a list, scale, and grid. You cannot limit people to one response per form. However, if you create a form with your school Apps account, you can choose to record the email addresses of people who fill out your form and track responses that way. Forms can be formatted with themes, shared via link, email or embedded with HTML, and responses are collected in a Google spreadsheet. Multiple choice questions offer the option to go to a page based on an answer and using page breaks (ex: If yes, skip to page 4). You can also allow users to edit their response after they have submitted the form. To stop accepting entries to the form, click the Form menu of your spreadsheet and uncheck Accepting responses by clicking on it. Responses to your form are automatically entered into a spreadsheet where you can view, organize, and visualize the data. Choose "publish response summary" in Edit Confirmation to allow responders to view results. Use Flubaroo to create self-grading quizzes! With Google drawings, you can create and collaborate on flow charts, diagrams, mind maps, graphic organizers and more. You can insert text boxes, shapes, word art and even links. Use the web clipboard to copy the whole drawing, or any selection within the drawing, and paste it into your doc using the web clipboard. Or you can go to Insert > Drawing to create a new drawing in your current doc. Where to go for help? !